Everyone one stay calm! The new Spider-Man trailer has released this month and fans are loving it! The movie had been announced to be release on July 5th, and there is so much in store for Spider-Man in this movie one can hardly wait to see what is to come. If you haven’t seen the trailer yet, go watch it, but be careful, it may blow your mind. Last time we saw Peter Parker was in Avengers Infinity War when he and his fellow Avengers were fighting to save the world form a villain who goes by Thanos. Now Peter is on his way to Europe for a class trip and no matter where he goes, trouble seems to always find him. At the beginning of the trailer, we see Peter Parker in his suit high fiving Aunt May, who now knows his big secret. Happy then barges in with a large check in his hand and compliments Aunt May. It was very clear between the two that there was some romantic tension orbiting around them and it was very clear to Peter, too. I think it would be so cute to see Aunt May get out there and date someone new, indicating she has finally been able to move past the loss of the legendary Uncle Ben (RIP) who remains in our hearts forever. We now cut to Peter Parker preparing for his school trip to Europe, packing, buying items, and picking up a passport with the most eyebrow-raising photo on it. There was a reference to Uncle Ben during the montage of Parker packing, for when you look closely you can see the initials of Benjamin Franklin Parker engraved onto the suitcase Peter is using for his trip. A cool little Easter egg the movie makers were able to slip into the trailer; did you notice it at first? Peter Parker is now off to Europe, more specifically, Venice! Along with best friend Ned and possible love interest, MJ, Peter is enjoying his trip just being Peter and not Spider-Man. Peter Parker and MJ are hinted to have a romantic connection in the movie as they are seen spending alone time together. In the first movie, Spider-Man Homecoming, their relationship was very friendly and not at all romantic but this time around it is clear things have changed. It is time to bring out the big guns! Nick Fury has made his way back and is…not dead? How he and Peter Parker survived Infinity War will all be revealed in Avengers: Endgame, a movie that comes out before this one. Nick Fury seems to be doing well and back to his usual espionage routine. His role in the film is to actually recruit Misterio an important character played by Jake Gyllenhaal. We will see how this recruitment turns out in the movie, but so far judging by the trailer…I don’t think he was interested. In the trailer, we are also given a glimpse of the Elementals, the villains of this movie who are seen Terrorizing Europe. In the comics, the Elementals were a team that consisted of Hellfire, Hydron, Magnum, and Zeffer. These villains can possibly be all seen in the movie but in the trailer, you only see Hydron and Magnum. So far, this movie seems to be pretty epic and fans are now aching for summer, so they can go see their friendly neighborhood Spider-Man. Though in this movie, it shows that sometimes you have to step up and watch out for more than just the neighborhood. This may be the great responsibility Peter Parker must take on when it comes to being a hero. 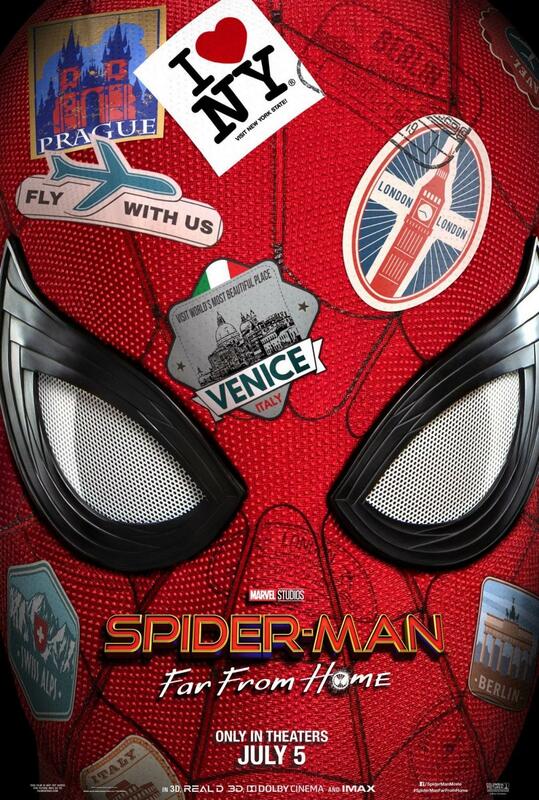 Only seven months away and Spider-Man Far From Home is on its way!